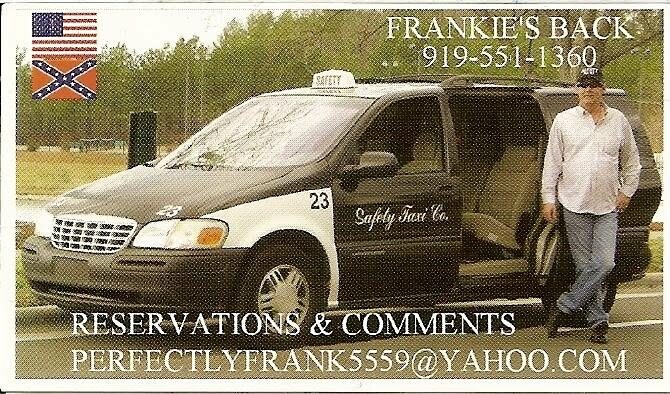 Beaterblog: Found Business Card - Frankie's Back! Need a cab to run you to and from the Check-N-Go or to your next craigslist purchase of a Ranchero? For all of your ride needs exclusively South of the Mason-Dixon, look no further than this guy. Friend of Beaterblog, Steve, managed to find this business card in Raleigh, NC. This is not an endorsement but why would you not ride with a guy with a trucker cap, black cowboy boots, and a business card like that? I Gotcha cabs is always the way to go. Who cares if all of the mirrors are covered with pictures of Gary's kids and the seats are freely arrangable? I don't. $3 to Hillsboro, $8 to downtown. Free raps.